Protecting, strengthening, and nourishing your back is essential to preventing back pain, and for supplementing medical treatment. The flexibility of your back enables all kinds of movements, but this same flexibility also makes your back at risk to all kinds of injuries. The key to avoiding and preventing back pain is to be proactive. Incorporating these helpful tips into your life can go a long way to having a healthier back. Before we talk about these tips, lets have a quick education session about why your back, specifically your lower back, is prone to injuries. Your lower back has segments that enables most of your bending and twisting movements. The two lowest segments, L4-L5 and L5-S1, have the “honor” of bearing the majority of stress during these movements. Those two segments, as a result, are at a higher risk of sustaining injuries from “wear and tear” and sudden movements. Strong core muscles provide support for your lower back, and they play a significant role in preventing injuries. Exercising and strengthening the core muscles will help increase blood flow to the spine, and in turn, help supply healing nutrients to your lower back. 1. Bridges: place both legs together on an exercise ball at/around the calves with your arms down at your sides. Tighten and lift the glutes up off the floor to straighten the back. Keep your core muscles tight and hold this position for 5 seconds. Return to the starting position and repeat this 15-20 times. 2. Quadruped Horizontals: starting position is on your hands and knees, with the arms directly under your shoulders. Slowly straighten the right arm, reaching forward, and keeping the neck and back straight. At the same time, straighten the left leg back, keeping it straight. Keeping the core muscles tight, hold this position for 10 seconds. Return to the starting position and repeat this 10 times with each pair. 3. Lower Trunk Rotations: place both legs together on an exercise ball at/around the calves with your arms down at your sides. Contracting your core muscles, rotate your knees to one side and hold for 5 seconds. 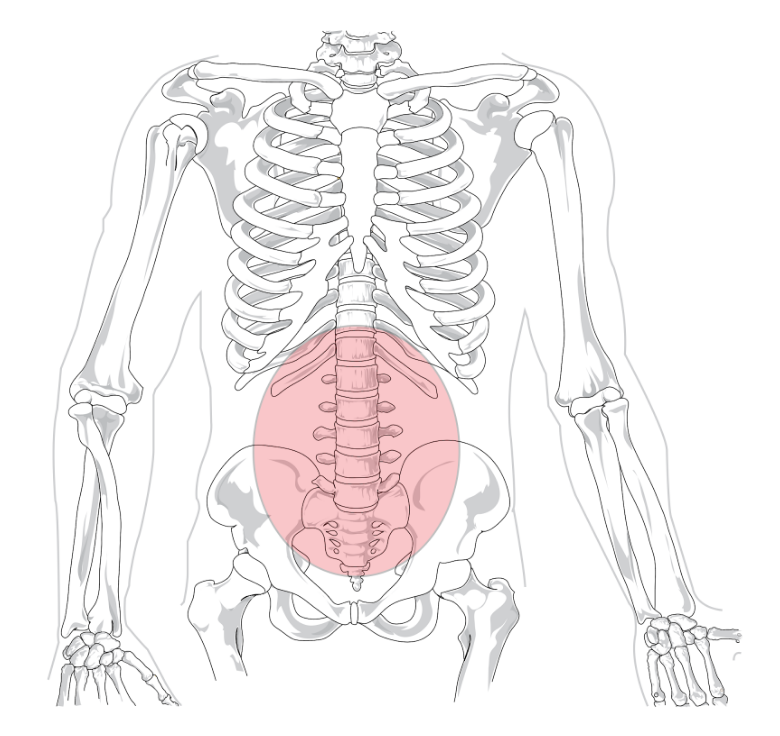 Slowly return to the starting position, maintaining core activation, before moving to the other side. Repeat this 15 times to each side. Many people don’t realize that their hamstrings, the three large muscles that run down the back of your legs, can easily become tight. Overly tight hamstrings put additional stress across your lower back, and as a result, can contribute to back pain. Seated Hamstring Stretch: Sit at the edge of a chair. Stick the right leg out, keeping the leg straight, but not locking the knee; the left leg will remain bent. Keeping your back straight, slowly lower yourself forward until you feel a slight pull/stretch in the hamstrings. Hold this position for 1 minute. Repeat this 2 times for each leg. Purchasing an ergonomic chair for your office/desk can help support the natural curves of your spine. While sitting in an office chair, sit up straight by aligning the ears, shoulders, and hips in a vertical line. Any prolonged sitting position, even a good one, can be tiring. Another great idea is to use a standing desk for part of the day, since sitting puts more stress on your discs compared to standing. While standing, distribute your body weight evenly to the front, back, and sides of the feet. It’s common knowledge that carrying extra weight places more stress and strain on your lower back. If you’re overweight, work in consultation with your doctor to develop a comprehensive plan to get your weight under control. Remember to avoid fad diets, and instead focus on eating the right amount of healthy foods and exercising daily (see Tip #1). You may not be able to incorporate all five of the above tips into your daily life all at once, so start with one or two and slowly build towards having a more proactive lifestyle for the protection your lower back deserves.